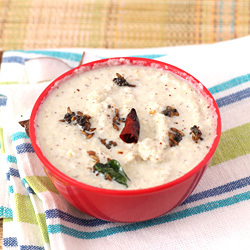 The combination of roasted dals, coconut, dry red chillies and garlic into coconut chutney powder is not only useful as temptingly spicy spread for toasts and sandwiches but also a must have accompaniment for dosa, rice and meals. It is one of the most versatile condiment in all south Indian homes. 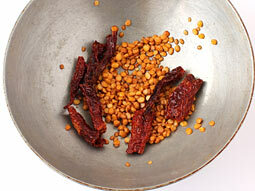 Roast dry kashmiri red chillies, urad dal and chana dal until light brown with 1/2 teaspoon oil in a pan. Transfer to a plate and allow it to cool at room temperature. 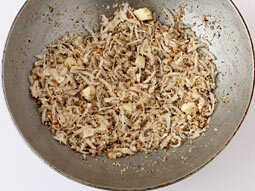 Roast grated coconut and garlic for a minute over low flame in same pan. Turn off the flame, transfer to plate and let it cool. Grind all roasted ingredients with salt into a powder using grinder or food processor. Make sure to not to make it very smooth powder, it should have little coarse texture. Dry coconut chutney powder is ready. Serve it with a meal or curd. 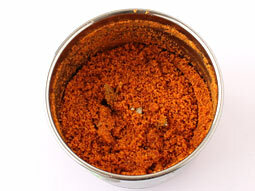 In this recipe, dry kashmiri red chilli is used to get nice color of powder and make it less spicy. If it is not available then you can also use normal dry red chilli, but add only 1-chilli because it makes the powder spicy. Make sure that all ingredients are cooled properly and are at room temperature before grinding otherwise you will not get delightful powder consistency. Store it in an airtight container and consume within 12-15 days or you can keep it in refrigerator up to 20 days. If you want to use fresh coconut then roast it over low flame until all moisture is evaporated and it turns light brown. Stir continuously while roasting. Use heavy based pan to roast all ingredients to prevent burning as well as slow and even roast. 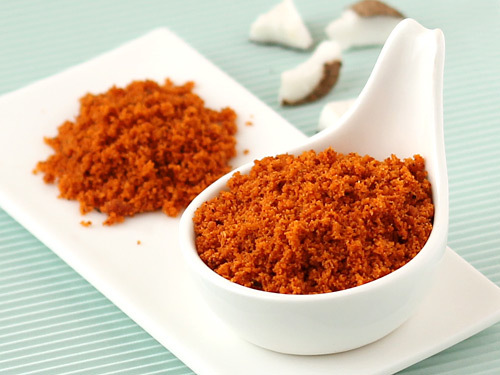 Serving Ideas: Serve this coconut podi with steamed rice, ghee and papad. Add some ghee or oil in it, mix it and use it as a chutney or spread for chapatis, dosas, parathas or an accompaniment in lunch.